Background Since 1997 – 2008 PPD made a long way of ups & downs. In 2000 PSCC established. 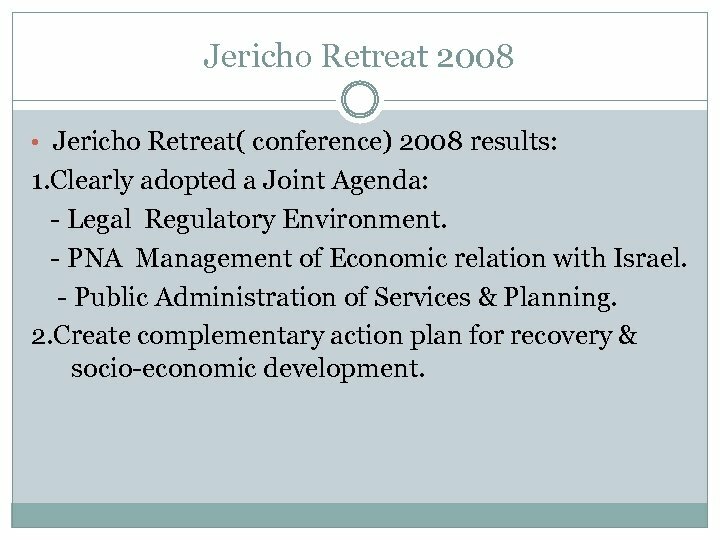 In 2000 Joint economic Committee established. 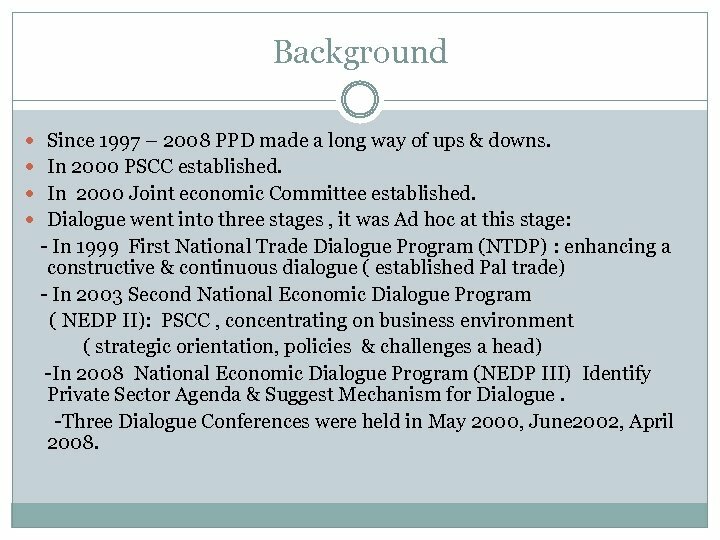 Dialogue went into three stages , it was Ad hoc at this stage: - In 1999 First National Trade Dialogue Program (NTDP) : enhancing a constructive & continuous dialogue ( established Pal trade) - In 2003 Second National Economic Dialogue Program ( NEDP II): PSCC , concentrating on business environment ( strategic orientation, policies & challenges a head) -In 2008 National Economic Dialogue Program (NEDP III) Identify Private Sector Agenda & Suggest Mechanism for Dialogue. -Three Dialogue Conferences were held in May 2000, June 2002, April 2008. Jericho Retreat 2008 • Jericho Retreat( conference) 2008 results: 1. Clearly adopted a Joint Agenda: - Legal Regulatory Environment. - PNA Management of Economic relation with Israel. - Public Administration of Services & Planning. 2. Create complementary action plan for recovery & socio-economic development. JR 2008 – con. 3. Established a Technical Unit (PSTU). Mandate: - Identify areas of priority in Private Sector Agenda & implementation of recommendations of the Joined Agenda. - Legislative action plan 2008 -2012. - Other issues that arise and potentially impact the business environment. 4. Design a Dialogue Mechanism. 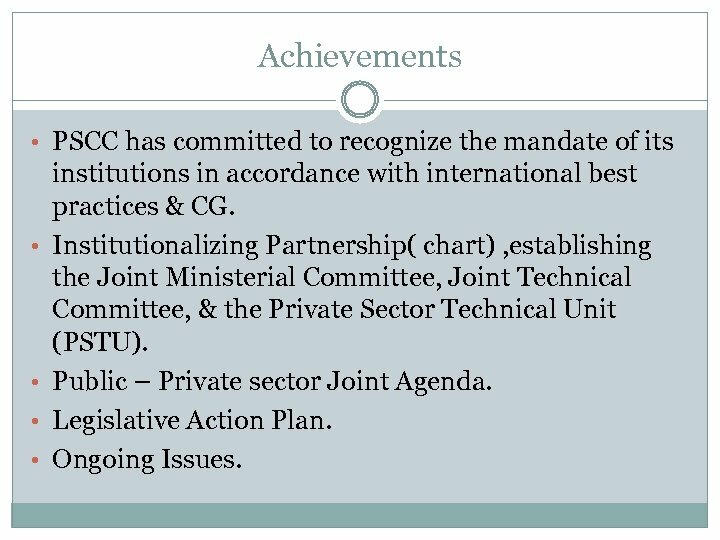 Achievements • PSCC has committed to recognize the mandate of its • • institutions in accordance with international best practices & CG. 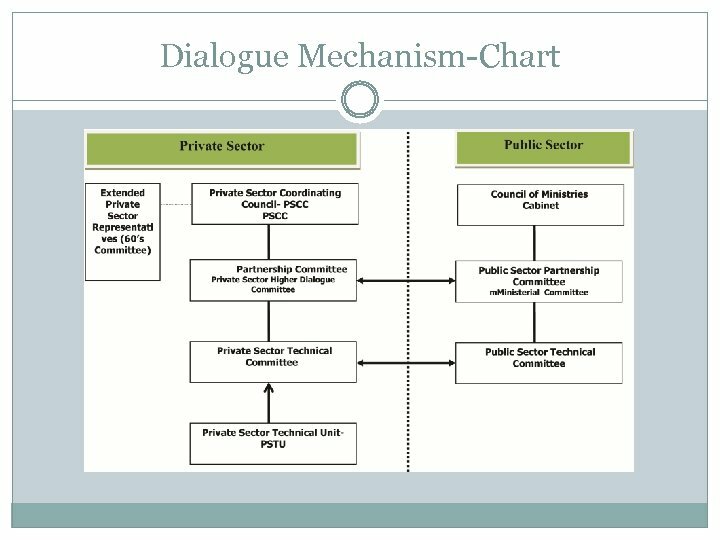 Institutionalizing Partnership( chart) , establishing the Joint Ministerial Committee, Joint Technical Committee, & the Private Sector Technical Unit (PSTU). 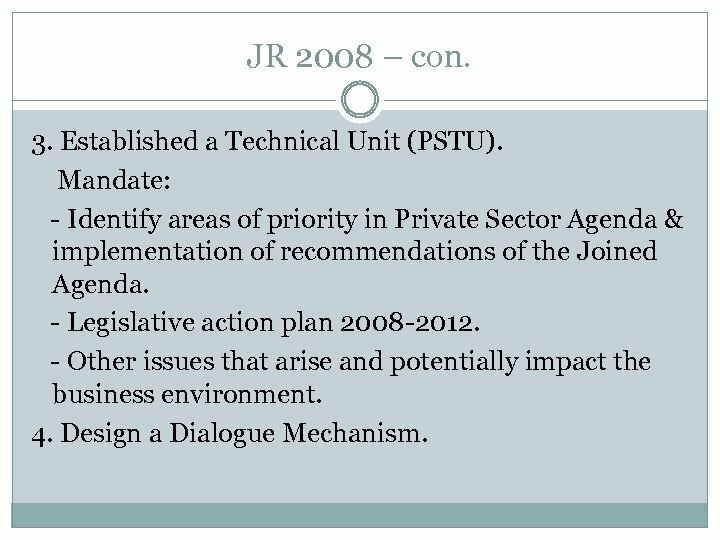 Public – Private sector Joint Agenda. Legislative Action Plan. Ongoing Issues. Cons. • • Instability, restrictions & impediments to the business environment. The interruption of the process, Not finishing the establishment of the system. • The government ability to meet the demands of the private sector , lack of financial resources. • • Worsening of the political process and its impact on the ground. Local challenges. The absence of Legislative council activities, separation of Gaza. • Postponing the meeting of Higher Dialogue Committee and the Ministerial committee several times yet to conclude the previous cycle of dialogue. 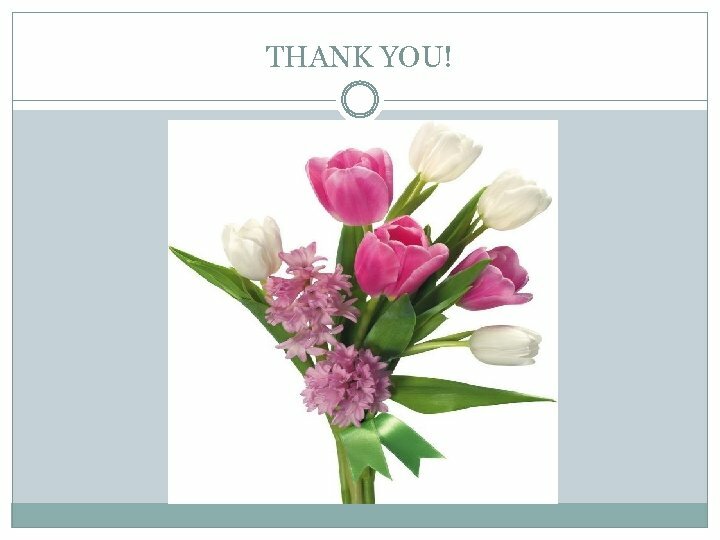 Endorse work agreed upon, take the decision on the issues that need the political level, and outline the process of the next cycle. 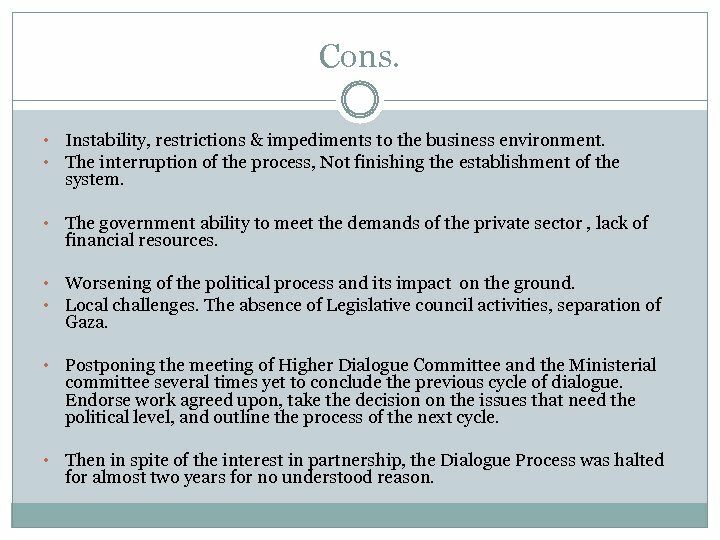 • Then in spite of the interest in partnership, the Dialogue Process was halted for almost two years for no understood reason. Pros. 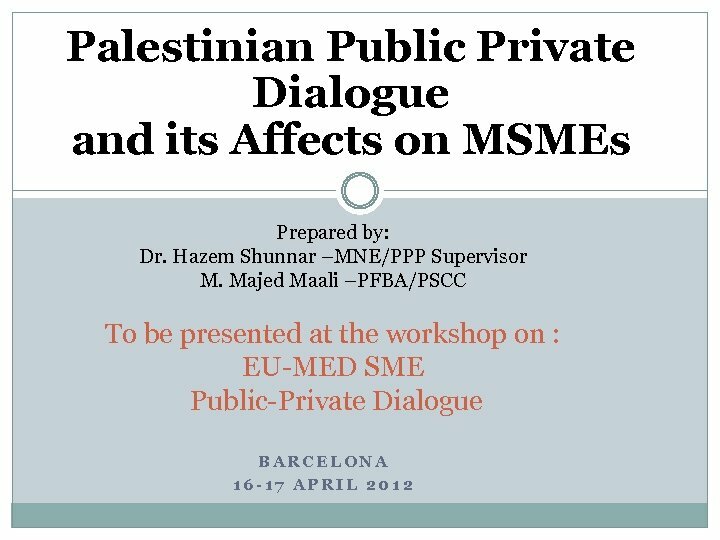 The interest of the Palestinian Government & the private sector shown in this dialogue. Also the big interest of Donors in this file. Renewing the process last few months since December 2011. - National Dialogue on Income Tax Law & other Fiscal & Economic Policies, in due process with substantial results so far. 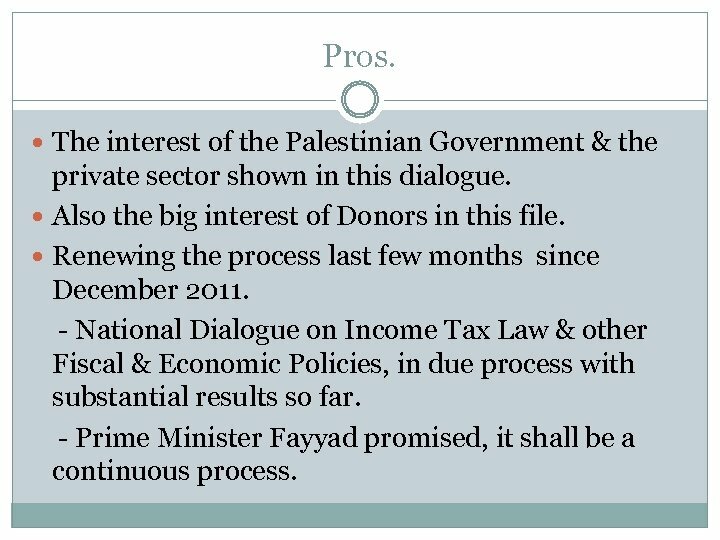 - Prime Minister Fayyad promised, it shall be a continuous process. PPP in MSME Establishment of MSME Advisory Council Nov. 2010 from representatives of public and private sectors MSME Development Agency is under establishment to: facilitate and promote economic development, job creation and poverty reduction It creates an opportunity for donor and development agencies to support the establishment and sustainability of the Agency through a basket fund mechanism. 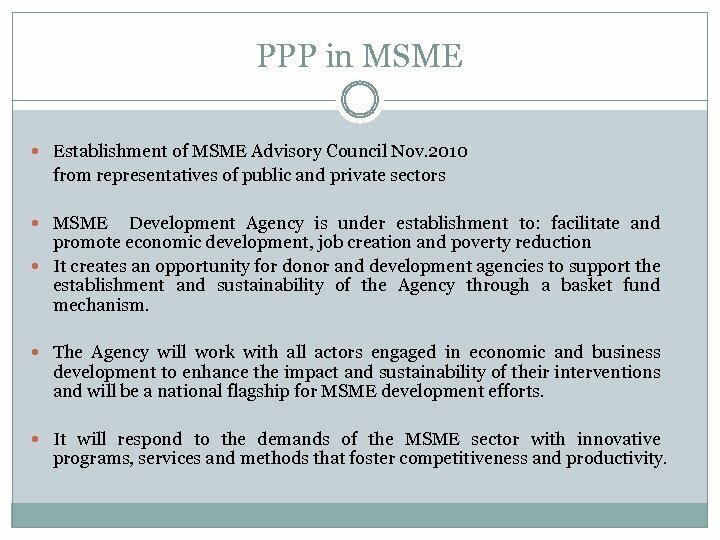 The Agency will work with all actors engaged in economic and business development to enhance the impact and sustainability of their interventions and will be a national flagship for MSME development efforts. 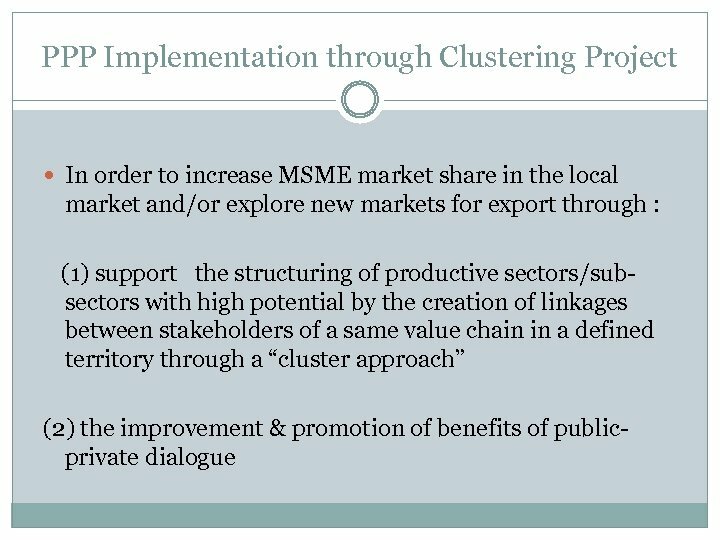 It will respond to the demands of the MSME sector with innovative programs, services and methods that foster competitiveness and productivity. 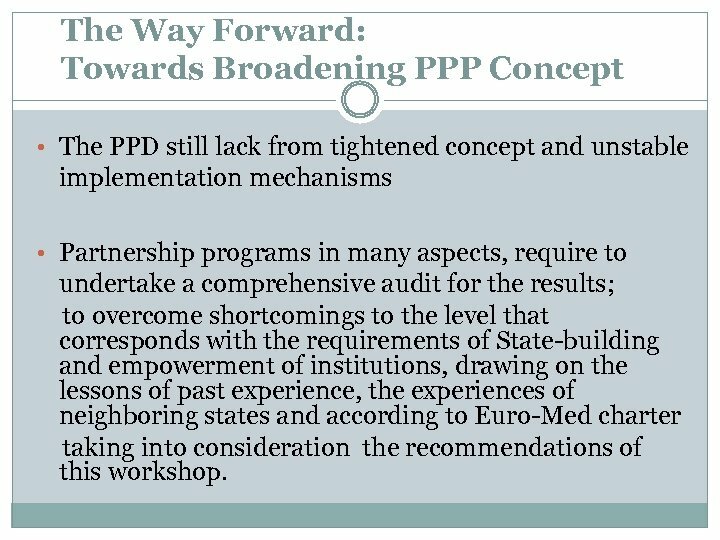 The Way Forward: Towards Broadening PPP Concept • The PPD still lack from tightened concept and unstable implementation mechanisms • Partnership programs in many aspects, require to undertake a comprehensive audit for the results; to overcome shortcomings to the level that corresponds with the requirements of State-building and empowerment of institutions, drawing on the lessons of past experience, the experiences of neighboring states and according to Euro-Med charter taking into consideration the recommendations of this workshop. Areas for Expansion/ cont. 2. Partnership in realizing social responsibility 3. Involvement of all interested parties in PPD: including of the third sector (workers and employees) in the national dialogue after assisting in achieving greater maturity and unity. 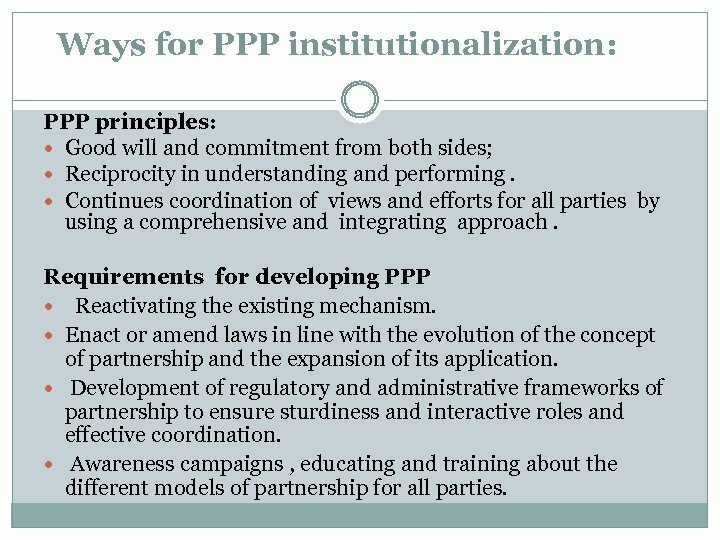 Ways for PPP institutionalization: PPP principles: Good will and commitment from both sides; Reciprocity in understanding and performing. Continues coordination of views and efforts for all parties by using a comprehensive and integrating approach. Requirements for developing PPP Reactivating the existing mechanism. Enact or amend laws in line with the evolution of the concept of partnership and the expansion of its application. Development of regulatory and administrative frameworks of partnership to ensure sturdiness and interactive roles and effective coordination. Awareness campaigns , educating and training about the different models of partnership for all parties. 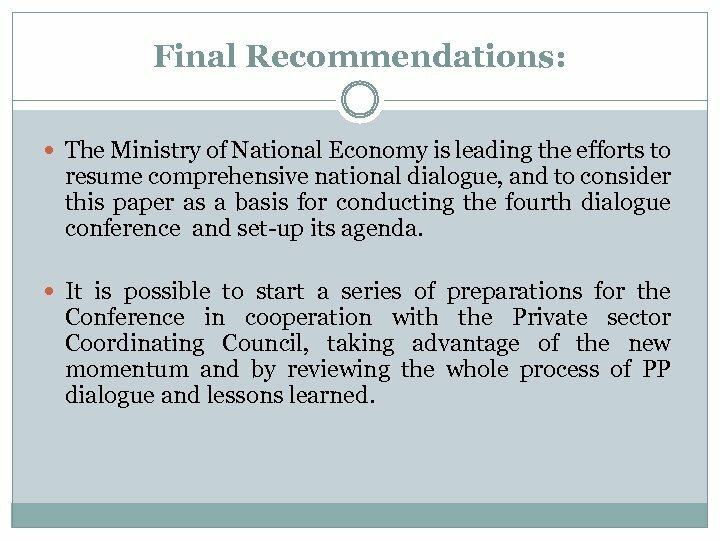 Final Recommendations: The Ministry of National Economy is leading the efforts to resume comprehensive national dialogue, and to consider this paper as a basis for conducting the fourth dialogue conference and set-up its agenda. It is possible to start a series of preparations for the Conference in cooperation with the Private sector Coordinating Council, taking advantage of the new momentum and by reviewing the whole process of PP dialogue and lessons learned.